HILLARY CLINTON MOCKS IMPEACHMENT PROCESS FOR HER SECRETARY OF STATE CRIMES | Public Advocate of the U.S.
"When he can't think of anything to say, Trump starts chanting it and you sit there and you think, 'Does he think I was elected?'" she said Tuesday. "I said something publicly a few months ago, Fox News is always trying to impeach me, so someone needs to tell them that it doesn't apply to a private citizen." Clinton was speaking at a Wing workspace panel discussion in New York, where she took on a wide range of issues, including Russian President Vladimir Putin and the tone of today's politics. "I would hope that we can change the political culture," she said. "Because I don't want anybody going through that. I don't care who you are. I don't care how much I agree or disagree with you. To be lied about persistently, to be vilified is very harmful." But it was her comments about Trump and Fox News that quickly became even more fodder for the network. "Fox & Friends First" slammed her early Wednesday. Impeachment is not a criminal process but a political process that any citizen can be charged with in the context of the use of the word in the English tradition and in the actual result of action by the U.S. Congress. 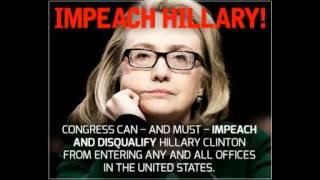 Proving Hillary Clinton wrong on Impeaching Hillary Clinton for her crimes performed as Secretary of State simply require a Congressional determination that they were, indeed, misled on the performance of her official acts. It is not improbable due to the unpredictability of the many Congressional actions pushing a Trump impeachment and the consequences of what is and has been for 200 years a political process. ADDITIONAL DELGAUDIO STATEMENT AND INFORMATION ON IMPEACHMENT HERE. "Public Advocate hosts a website to collect signatures on our effort to impeach Hillary Clinton and we are very clear this is a political process to bar Hillary Clinton from holding any future federal office in the future and that is what she is in fear of," said Delgaudio. This is the link to the IMPEACH HILLARY CLINTON website.